Yep, PrestaShop is celebrating its 8th birthday with cakes, animal balloons and champagne. Being one of the market’s old-timers, it went past a whole jungle of trails and challenges that crystallized PrestaShop into a solid, innovative and prominent shopping cart. But what are those ripping features that allowed the team of PrestaShop to build a 800,000 members community around its technology? Price. Whereas the fact of PrestaShop, an open source solution, being free is expected, its hosted version - PrestaShop Cloud - offers hosting for precisely nothing as well! Thus, hosted or non-hosted, you get an amazing e-Commerce platform merely for “thank you”. Extensions. PrestaShop has a giant marketplace with a tremendous number of extensions, free and paid ones, able to turn your e-store into a retail monster. SEO-Friendliness. A half of SEO is already done when you choose PrestaShop. Progressive out-of-the-box search optimization features allow you to achieve the highest Google ranking leaving no chances to your competitors. Management. Getting a full control over your e-store is now easier with a logical and stylish PrestaShop admin panel. It provides businessmen with all needed management tools and statistics on purchases, website visits and customer actions. Multistore Feature. Grow a whole e-store network with PrestaShop and control every single online retailer within one administrative panel. Customization. PrestaShop is an utterly flexible solution easily adjustable to every merchant’s needs. Possessing more than 2000 unique templates ready for improvements, PrestaShop allows you to get in creative control of your online retailer without knowing a lick of programming. Lightweightness. Whilst it is one of the most functionally powerful solution, PrestaShop is still considered to be among the most resource efficient ones. Even a large-scale doesn’t requires expensive servers to run and impress its customers with a fenomenal loading speed. Constant Improvement. PrestaShop goes in step with the times joying its giant community with the regular updates and fixes. Starting from version 1.0, PrestaShop team has tripled the amount of code lines and made some significant functionality enhancements. In a result of being such a popular platform among store owners, Cart2Cart has established the support of all 98 (!) PrestaShop versions (including PrestaShop Cloud) and a widest range of transferable entities. Hard to believe it’s true? Give it a try with free Demo Migration to PrestaShop! 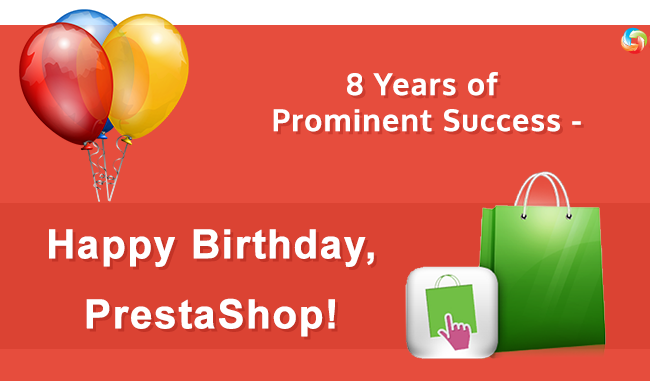 In a conclusion, we’d like to congratulate PrestaShop with its 8th birthday and wish the team standing behind this astonishing solution to celebrate at least 22 more. Keep it up, PrestaShop!